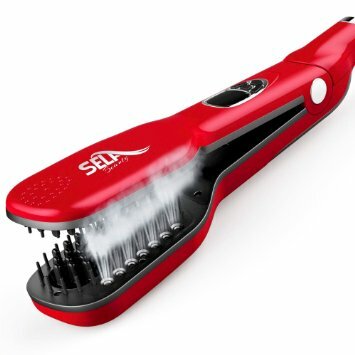 #steambrush I've tried many different hair straighteners but I've never had one that was so easy to use and had such good results until I tried the Sela Hair Straightening Brush. This straightener uses steam which seems to be the secret to smooth healthy looking hair. It comes with a plastic 30 ml bottle to fill the water resevoir with and it has 5 different temperature settings for all hair types. It only takes 90 seconds to heat up. I was very pleasantly surprised at how easy this straightener was to use and at how much faster it is to use. With a regular flat iron I had to go over each section of hair several times, not with this one. It has both ceramic plates and 3D bristles that separate your hair as you're straightening it, leaving it so smooth and healthy looking. Every woman should have one in my opinion.